Overcome the obstacles of your time-critical transport challenges! Unusual and urgent transport challenges get the team at Lobina buzzing! As soon as the phone rings, or an enquiry drops online, we’re on it – looking into the best options for the client within minutes. To us, overcoming obstacles makes our success sweeter – and with our experience in the logistics sector, no challenge is too difficult or complex! Here’s why we think we should be the transport partner for your business or organisation when jobs are time and mission-critical. Lobina has 25 years of experience in time-critical transport. We know the tried and tested solutions that will work 24 hours a day, seven days a week and we have an impressive network of connections around the world. But in this ever-changing world there’s always something new to consider – and that’s where we really smash it! We are creative problem-solvers and we love it when we find a solution that helps us make that delivery safely, efficiently and on time. 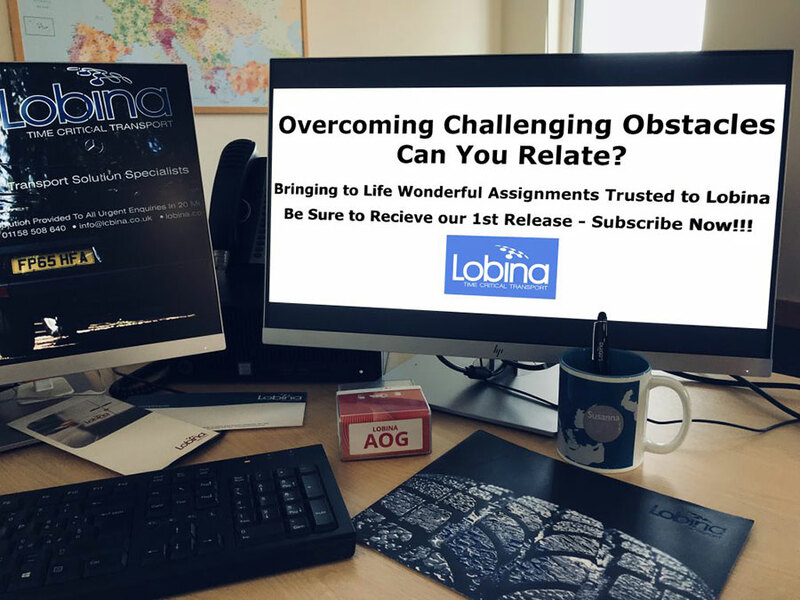 If you want a chat about how Lobina can help overcome the obstacles you face when it comes to making a critical delivery on time, call 01158 508 640 and ask to speak to Susanna or Luigi who will be happy to assist. We never have just one plan of action. Life’s not that simple. From the moment you get in touch, the Lobina team are working on multiple solutions. It gets pretty competitive in the office as we pull quality options together so that you, our client, can choose what suits your needs and priorities best. When it’s out of traditional office hours you can still rely on Lobina to fly into action – our response times are what sets us apart from our competitors. Communication is a key strength at Lobina. You won’t need to waste your valuable time chasing us to find out what’s going on. We’ll provide updates every step of the way as your shipment moves to its destination. It’s easy to do business with us and to know that you are in safe hands and can relax and enjoy peace of mind. Our success is your success. Lobina’s quality logistics options and our track record will make you look good in front of your directors and shareholders and further your own career. Your customers can be assured that you are buying transport solutions from the best. We only employ staff members who buy-in to our work ethic. We are energetic, relentless, brave, persistent and honest and that gives you a competitive advantage that will help you to grow your business. Our highly-motivated team of time-critical logistics experts thrive on getting you the results you need. Our commitment and dedication to finding on-time delivery solutions will help you to surpass your goals, whatever the obstacles and time-critical challenges the world throws at us. Show your customers that you are the perfect partner to resolve their problem delivery situations in the quickest time possible. Tap into Lobina’s extensive expertise and our network of trusted partners and you can increase your own opportunities to achieve more referrals with bigger clients. You can have 100% confidence that Lobina can help you get the results you want. We’ll leave no stone unturned to overcome the challenges you face round the clock and round the world. We are fuelled by the passion of hitting those deadlines and getting your shipments through against all the odds. Do you know someone who is hungry for success and needs a trusted partner to achieve deliveries on time, to budget and with safety assured? Why not do them a favour and share this post with them using the ‘share’ icons below.